Southwest Airlines is Club Carlson’s latest airline partner. You can earn 600 Rapid Rewards points per stay at Club Carlson locations worldwide. Make sure to have your Rapid Rewards number on hand when checking out. There is no need to register for this offer that you can access here. 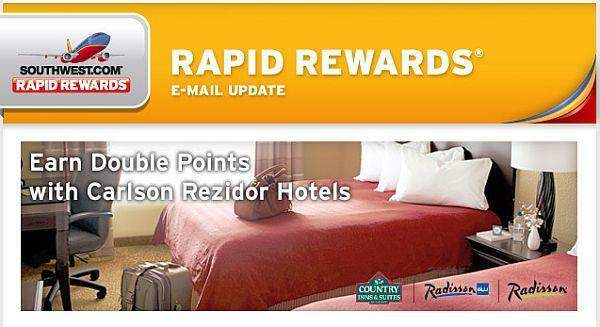 To celebrate this new partnership, Club Carlson has launched a double Rapid Rewards points promotion that is valid for stays between January 18 and March 31,2013, at the Radisson, Radisson Blu, and Country Inn & Suites location in the United States for Sunday through Thursday check ins. Note that Park Inn and Park Plaza brands do not participate to this double points promotion. You will receive 1200 Rapid Rewards points per stay instead of the usual 600. 1200 Rapid Rewards points are worth $20 when used Wanna Getaway fares, $12 when used for Anytime fares, and $10 when used for business fares. It is good that Club Carlson is introducing a new airline partner. You cannot yet converts Gold Points to Rapid Rewards points (I tried), but I am sure that this feature is coming at some point. This is good option for those that are looking for more options to collect Southwest Companion Pass Qualifying points. An eligible stay is defined as a stay of one or more nights at the same participating hotel, regardless of the number of times you checkin or check out during the stay at an eligible rate. Ineligible rates include employee rates; airline crew rates; travel agent rates; hotel employee rates; tour operator rates; wholesaler rates; rates booked through online travel companies; and complimentary rooms, including, but not limited to, rooms booked as Award Night stays or other stays involving other gift certificate or free night vouchers. Double Rapid Rewards Points cannot be earned at Park Inn or Park Plaza Hotels. The Double Rapid Rewards Point Offer (“Promotion”) is available for new reservations at participating Radisson, Radisson Blu, and Country Inns & Suites By Carlson hotels in the United States (“Participating properties”) for eligible stays with a checkin date on a Sunday through Thursday, beginning January 18, 2013 and completed by March 31, 2013 (“Promotion Period”). Participating properties are subject to change without notice. Carlson reserves the right to add, modify, or discontinue these terms and conditions with or without notice. Void where prohibited by law. Please allow six to eight weeks after check out for your points to post to your Rapid Rewards account. All Rapid Rewards rules and regulations apply.